Vermont senator and former presidential candidate Bernie Sanders takes readers to the front lines of the fight against conservative POTUS Donald Trump‘s agenda in his new tell-all, Where We Go From Here: Two Years in the Resistance. Sanders’ earlier Our Revolution: A Future to Believe In became available shortly after Donald Trump’s election, documenting the sociopolitical implications of Sanders’ grassroots campaign in spite of his loss. This new release depicts what exactly happened after. During his 2016 presidential campaign, Sanders made headlines for his political beliefs, including his support of universal healthcare and a $15.00 federal minimum wage. With incessant news coverage of Donald Trump’s bombastic personality (and the shenanigans of this years’ news—think celebrity rapper Kanye West’s visit to the White House) Bernie Sanders hasn’t gotten the same amount of coverage despite remaining generally popular. Now, he’s revealing to the public what exactly he’s been doing in the past two years to represent progressive voices in the midst of a conservative administration. 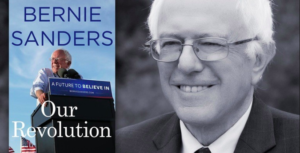 While Where We Go From Here reveals a deep fear of political apathy, it also offers a “hopeful view of America’s uncertain future.” While political commentators believe the book hints at a 2020 campaign, Sanders has not confirmed these rumors.